One Friday night in the early fall, I was watching Real-Time with Bill Maher, a political show that brings together people from all political views to discuss topics of the day in a panel format. Because my teacher-brain is always on the go, I had a vision of my classroom with my students as the expert panelists and the quick-fingered audience “Tweeters.” (You know, a classroom discussion euphoria of sorts…) After some contemplation and tinkering, my vision became a reality, and it has quickly become a class favorite discussion technique. The students like that they can express their opinions in several formats and how easy and fun it is to discuss with the guided open-question format. 1) All students are engaged because they all get a chance to be on the panel. When they’re in the audience, they participate in a digital or print version of a “Twitter” chat, just like a real audience does. The panel only has four or five members, so the panel gets plenty of opportunities to discuss; once they’ve contributed to the discussion several times (you can determine the number), the students rotate, so new panel members come in and out. 2) My role, as the teacher, can be as big or as little as I want. I can be the moderator of the discussion, or I can hand that role over to a student. 3) The discussion is guided by the moderator, so the nature of the discussion is targeted, on-level for the grade/ability level, and content-focused. 4) It is so easy to set up. Begin by making copies of the rubric, participation tracker, participation tracker number line, and name plate/notes. Each student needs one copy of each. Then, decide on the number of students you want on the panel. Four or five students is a good number for my class. Less than four students makes it hard to generate discussion; More than five students makes it challenging to give everyone an equal turn. Compile a list of topics for discussion. 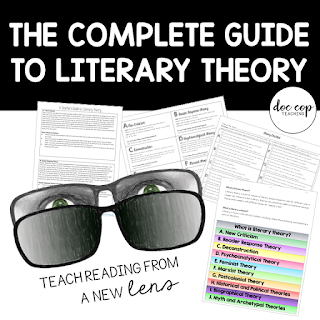 I like to use topics that focus on a central theme or concept for the work as a whole. For example, when I teach Macbeth, my topics are sleep, guilt, the role of women, revenge, the struggle for power, and supernatural elements. I give each student a topic or two and instruct them to become an expert on those topics. 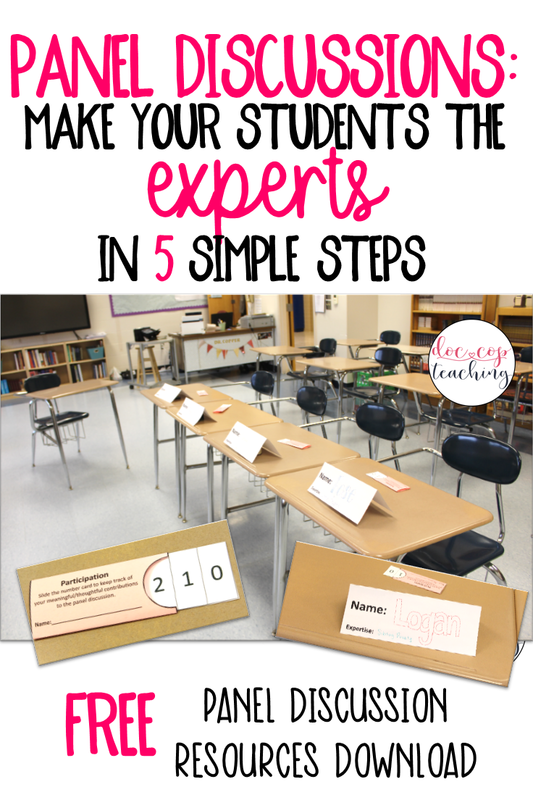 At this point, students should fill out their nameplate with their name and expertise (their topics). Additionally, they may take notes on their topics on the back of the nameplate. This makes it easy for them to view their notes as the nameplate will follow them during the discussion. I also like to give them my Literary Theory Checklist, so they can think about what literary theories apply to the given work. It gives them multiple perspectives to bring to the panel. You can check it out here. To prepare for your end as the teacher/moderator, print the example questions included and/or create your own. I use “cue cards” to help keep me organized. After practice, you may decide to have a student moderate the discussion. 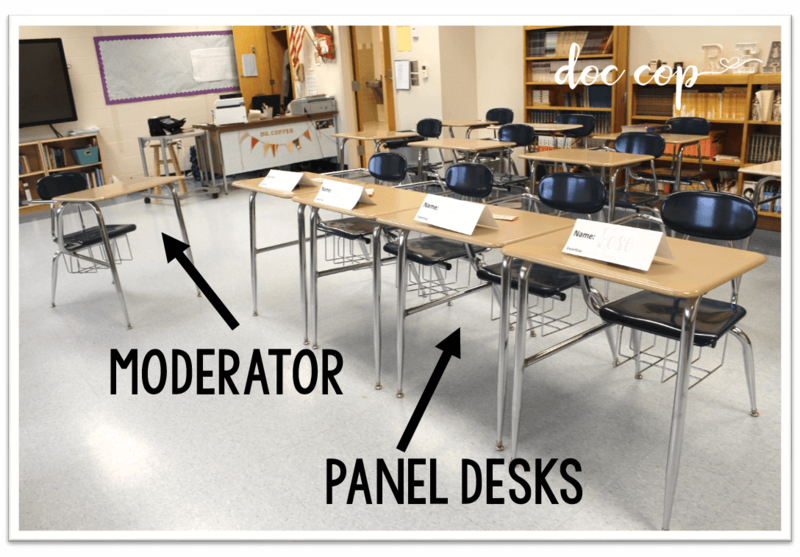 On the day of the panel discussion, put together a group of four or five desks for your panel and another desk facing the panel for the moderator. The “audience” should be seated in front of the panel. Give each student a participation card to keep track of his/her meaningful contributions to the discussion. Assign the audience a silent discussion. Either, they can work in pairs to comment on the panel discussion by passing a piece of paper back and forth, or you can create a backchannel chat for students if they have access to the internet. My favorite backchannel chat is Today’s Meet. Once a student has met the criteria for his/her contributions to the discussion, he/she should change places with a student in the audience. Continue this process until each student has had a chance to participate on the panel. Here’s an example of Today’s Meet that I posted on my Instagram account after our panel discussion on King Lear. Follow me on Instagram @doc_cop for more teaching tidbits. I hope you and your students enjoy this panel discussion! I’d love to hear from you! I love this! I absolutely know what you mean about "teacher brain" always connecting everything everywhere to the classroom. I can't imagine students being any less than fully engaged with this creative activity. So glad you linked up with me at Spark Creativity! Hope to see you next Tuesday! Hi – how do we download the FREE Panel Discussions Resources? (I couldn’t find them on TPT and I signed up for your newsletter (both my work and private accounts).